Waiting isn’t typically something human beings are good at. So when you look at something like the Google Play listings for the Nexus 5 that show shipping dates ranging from 2-3 weeks to 3-4 weeks (or out of inventory altogether), most would start to look for other options. 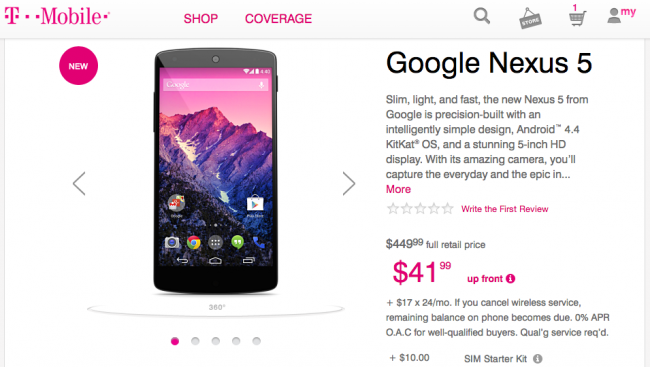 One of the newest options comes to us via T-Mobile’s online shop. We were previously told to expect the new Google flagship phone to arrive on November 14 at T-Mo, and sure enough it has for $449 at full retail or $17 per month installments. Now, clearly that price is higher than the $349 Google is charging for the same 16GB model in all black, but again, this one is in stock today, whereas the version sold through Google Play is completely out of inventory. If you don’t feel like waiting, here is your option. Is having the phone now worth an extra $100? That’s up to you to decide. If you go the monthly installment route, which is made of 24 separate $17 payments, don’t forget that you’ll also have to throw in $41.99 down.